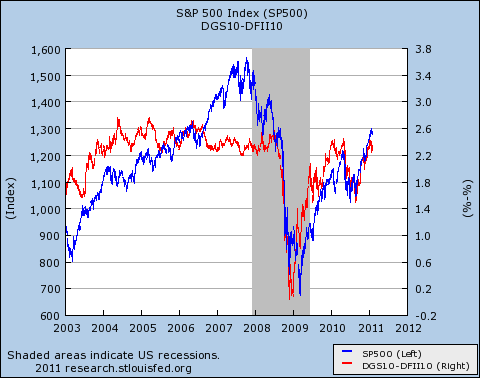 ….In my view the time-varying correlations between inflation expectations and stock prices are one of the most important pieces of evidence we have that [aggregate demand] became a problem after mid-2008. It will be interesting to see if those economists who are skeptical of demand-side explanations can come up with a plausible alternative explanation for this pattern. Paul Krugman agrees: “It’s demand, all the way.” Sadly, neither Glasner, Sumner, nor Krugman explain in terms someone like me can understand why this correlation implies that aggregate demand is what’s behind our economic woes. I feel a bit like a dummy, since they seem to expect this to be obvious, but hopefully someone out there in the econ blogosphere will take pity and explain this in laymen’s terms. When they do, I’ll write a followup. In the meantime, apparently we have one more piece of evidence that our big problem right now isn’t regulatory uncertainty or the federal debt level or structural unemployment. It’s low aggregate demand, just like you’d expect.